A Vice-President of the European Commission is a post in the European Commission usually occupied by more than one member of the Commission. 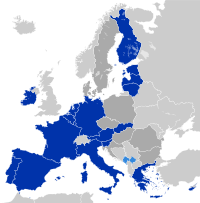 Since the 2009 Lisbon Treaty entered into force, one of these is ex officio the High Representative of the Union for Foreign Affairs and Security Policy, with the others being appointed at the discretion of the Commission President. Any Vice-President occupies this role in addition to the usual portfolio as Commissioner. Although the post of Vice-President gives little extra power, it is seen as important in appointments. Commission salaries are set as a percentage of the top civil service grade. Vice-Presidents are paid at 125% (€22,122.10 monthly), in comparison to 112.5% (€19,909.89) for normal Commissioners and 138% (€24,422.80) for the President. However, the Vice-President who is also the High Representative, is paid at 130% (€23,006.98). There are further allowances on top of these figures. The First Vice-President usually takes on the main role of a Vice-President: taking over from the President in their absence. The current First Vice-President is Frans Timmermans. The Previous First Vice-President was Catherine Ashton who was also the High Representative of the Union for Foreign Affairs and Security Policy. First Vice-Presidents are in italics. This page was last edited on 21 March 2018, at 00:12 (UTC).